By the power invested in me by myself and the internet, I declare this week to be American Kestrel Week here in Brooklyn! Here’s a male Falco sparverius perched in a London Plane in the ‘hood. Right next to my apartment building, as a matter of fact. Often called North America’s smallest raptor, this colorful little falcon is roughly the size of a Blue Jay. 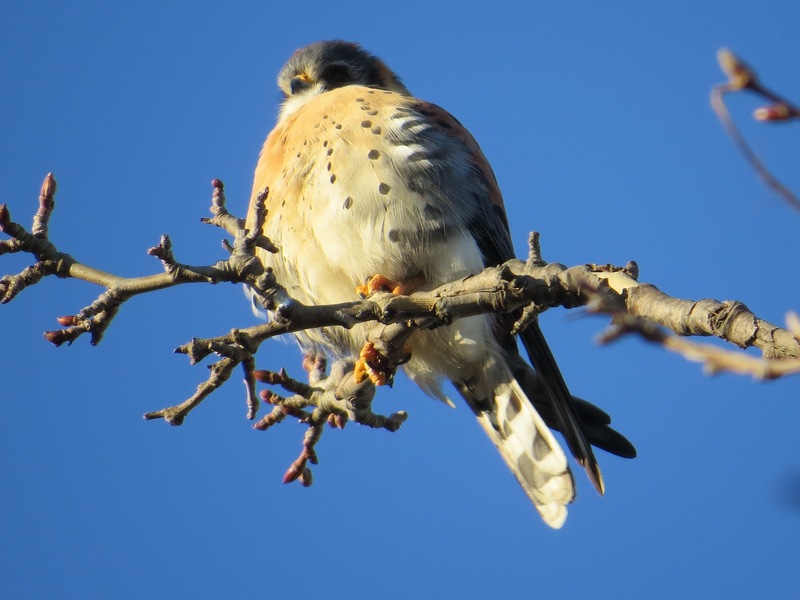 Male Kestrels weigh from 3.5-4 ounces and are about 10.5″ long. (The male Sharp-shinned Hawk (Accipiter striatus) can actually be a bit shorter and lighter.) Female Kestrels are slightly larger. 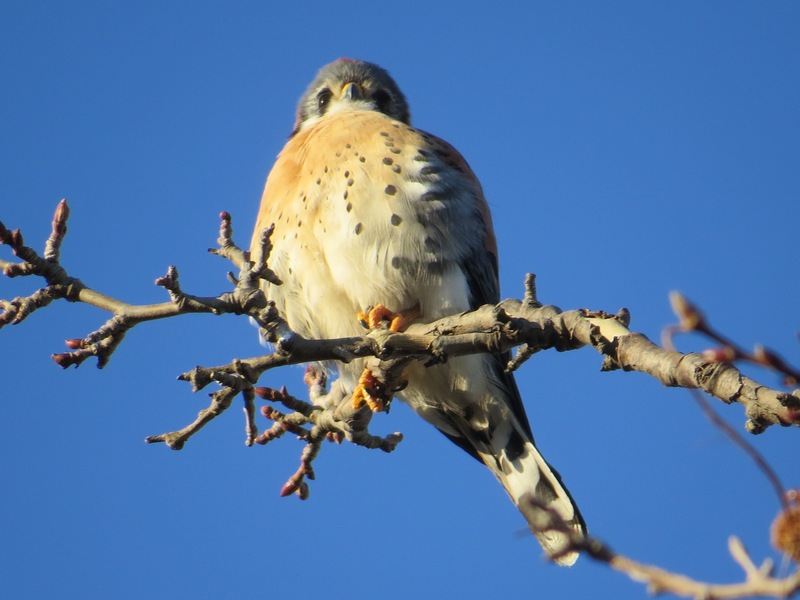 Kestrels are the most common nesting raptor here in the NYC. They’re often go unnoticed, however, because they’re so small. They’re not big and charismatic like the Peregrines and Red-tailed Hawks that hog the hullabaloo. Kestrels are hiding in plain sight. Small, but fearless: they are known to go after Ravens, Red-tails, and other much big birds in defense of their turf. 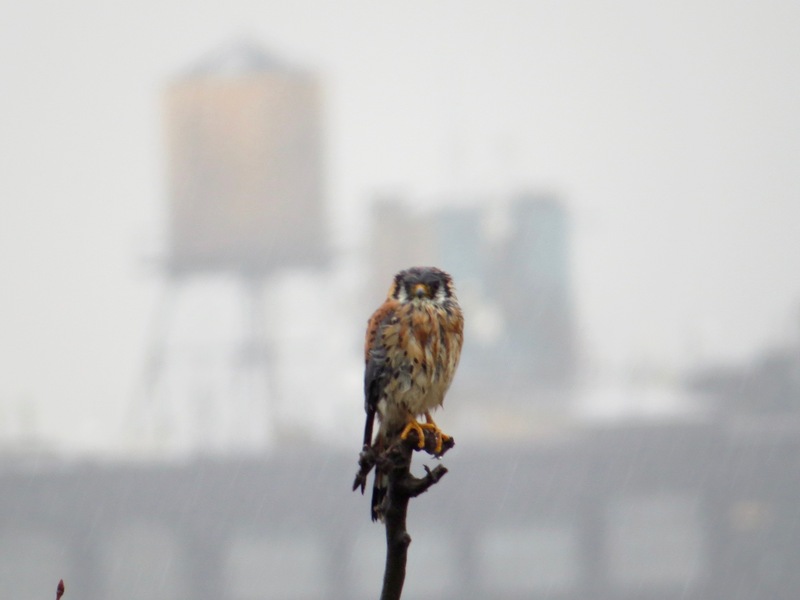 NYC Audubon is hip to this tiny mighty falcon: their logo is a Kestrel. Many a time I’ve been looking and listening — for they can be a very vocal species indeed — and the remarkably senseless mass of my fellow urbanites walk by unknowingly. “Killy-bird” is an old name for them, since one of their calls sounds roughly like “killy-killy-killy.” Sparrow hawk, grasshopper hawk/falcon, house hawk are other old common names for them. Windhover, adopted from the Eurasian Kestrel, is another. Kestrels have taken to the city surprisingly well. There’s food: insects and small mammals in summer, small birds and mammals in winter. The insects include dragonflies, beetles, grasshoppers, which the birds will sometimes eat on the wing, dipping their bills down to grab bits from their talons as shards of exoskeleton fly through the air. They’ll also eat reptiles and amphibians: like most raptors they’re opportunistic. The species is a cavity-nester. That’s pretty unusual for a North American raptor. Nest boxes elsewhere seem have have helped them, but here in NYC, a curious coincidence of historical architecture and poor maintenance has led to hole-ridden cornices on the city’s late 19th and early 20th century buildings. See this DeCandido/O’Brien/Allen survey that found dozens of such cornice nest sites in the city; I reported one on 17th St. in Manhattan. These cornices evidently make for good nooks for Kestrels (and Starlings, Pigeons, and House Sparrows), although the drop for the young ones is a doozy. Did you know that Kestrels use very little to no nesting material? Their larger falcon cousins, the Peregrines, use nothing at all in their scrapes. The name “Kestrel” comes from the Common/Eurasian Kestrel (Falco tinnunculus). The roots of the name are in the French crecerelle, a diminutive for a noisy bell, probably because of the birds’ call. And fondness for churches as nesting locations? See: Tornfalk.